According to the FMCSA, 3,864 fatal crashes and 104,000 injury crashes involving large trucks occurred in 2016. While large trucks can cause accidents in many ways; one reason is a driver’s loss of control due to an overweight or improperly loaded truck. When the cargo on a semi-truck or other large commercial vehicle has not been loaded or secured properly, it can shift making it hard for a driver to operate it safely, sometimes even leading to the driver’s loss of control as a trailer sways or fishtails on the road. Cargo can break loose or shift making the truck unstable and increasing the likelihood of an accident. A semi-truck’s load must be properly distributed so that no single axle is overloaded, causing the truck to be off balance. Unequal weight distribution is one of the leading causes of jackknife and rollover accidents. When building your case, the lawyers at Nash & Franciskato will investigate many different factors to determine responsibility such as who loaded the cargo, who secured it and how it was secured plus review maintenance and inspection records and weight loads. We will work to obtain the maximum compensation for you from all liable parties. Accidents involving a semi tractor-trailer or other large commercial vehicle can be catastrophic. 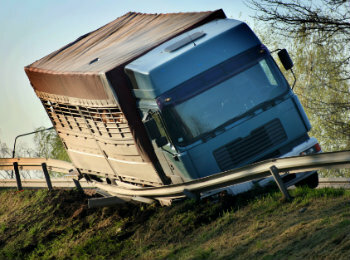 To protect your interests, it is critical to consult with an experienced truck accident lawyer. 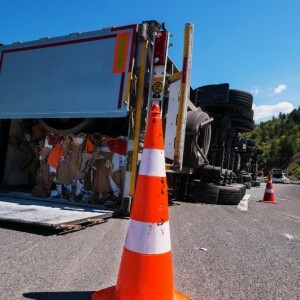 Nash & Franciskato, a Kansas City based personal injury law firm, represents those injured in commercial trucking accidents caused by overloaded and improperly loaded semi-trucks. Contact us for a free, no-obligation review of your case. Who regulates the truck driving industry? Federal laws and regulations govern our nation’s trucking industry. These regulations, the bulk of which can be found in Title 49 of the Code of Federal Regulations, establish standards that trucking companies, owners and drivers must meet. How do you know the weight limits of a truck? You will typically see a rating such as “G.W. 40,000” or “”G.W. 80,000.” This number refers to the maximum combined amount of freight load and vehicle weight the truck must adhere to. No truck may carry more weight than is permitted by the rating and should not exceed a GVWR of 80,000 pounds. Truck drivers are expected to make regular stops at weigh stations to ensure loads do not exceed the truck’s GVWR or FMCSA regulations. What is meant by improper load? What are the securement laws of cargo on tractor-trailers? All devices used to secure cargo trucks be functional enough to meet performance criteria set by the agency. In other words, there should be no weakened or damaged parts that could affect their performance. In addition, cargo securement systems must withstand certain deceleration and acceleration movements in forward, rearward and lateral directions. Drivers and loaders to make sure that truck loads are tied down using a number of devices including webbing, steel straps and other devices. Tiedowns must be secure enough so that they do not open, release or loosen during transport, preventing the cargo from becoming loose and flying off. When cargo is loaded on a truck it must be firmly secured by structures equipped to hold it, including dunnage (material used for cargo protection) or dunnage bags (inflatable bags used to fill space and prevent cargo shift) tiedowns and shoring bars. Find more details in the FMCSA Driver’s Handbook on Cargo Securement.